It’s been almost 4 months since the announcement of Pluto’s fifth moon, and nearly a year and a half since the discovery of the one before that. But both moons still have their initial letter-and-number designations, P5 and P4, respectively… not very imaginative, to say the least, and not really fitting into the pantheon of mythologically-named worlds in our Solar System. Of course, official naming conventions exist per the International Astronomical Union (IAU) and so the names for Pluto’s new moons should follow along with the others; that is, have some relation to Greek mythology insofar as they pertain to denizens of the underworld, over which Pluto was master. Pluto was the god of the underworld in Roman mythology. Charon, the largest of Pluto’s moons, is named after the mythical ferryman who carried the souls of the newly deceased across the River Styx, which separated the world of the living from that of the dead. 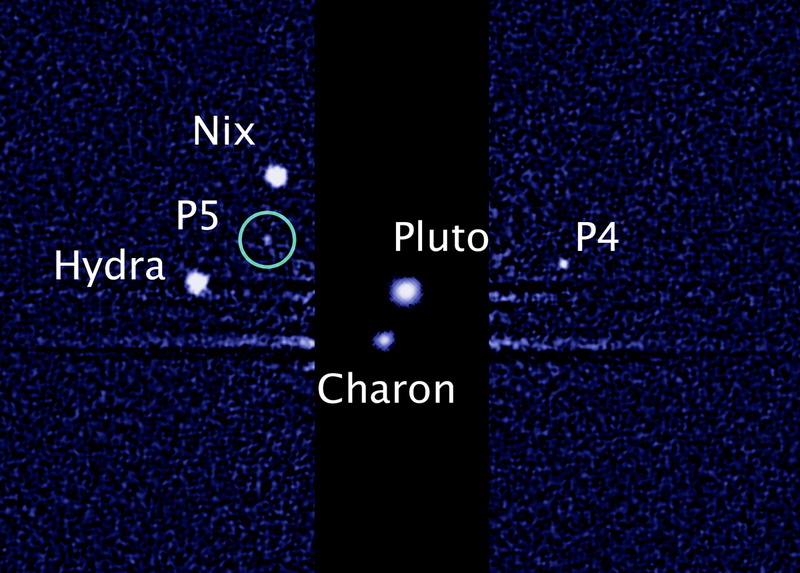 Nix, Pluto’s second-closest moon, was the Greek goddess of darkness and night, and Charon’s mother. Hydra, the third closest to Pluto, was a many-headed serpent that guarded a back entrance to the underworld located deep below the surface of a lake. In other words, “Mickey”, “Walt”, or “Clyde” (as in Tombaugh) wouldn’t be considered, however appropriate they might seem to some. According to the New Horizons research team, after the discovery of P4 in June 2011 it was decided to wait to see if any more moons were discovered (and a year later there was) so as to be able to choose names that fit together as a pair, while also following accepted IAU convention. As such, now that we have a P4 and P5 (both in dire need of honest names!) I think a decision is in order. And of course how better to decide such things but by popular vote! So what do you think the IAU should name Pluto’s newest moons? I’d asked it before the discovery of P5 and so I’ve put some suggestions onto a new ballot below, and feel free to suggest your own as well. If we get enough, I’ll send them over to someone on the New Horizons team… who knows, you may help decide the future of astronomical nomenclature! Follow the New Horizons mission at the mission website here and on Twitter @NewHorizons2015. 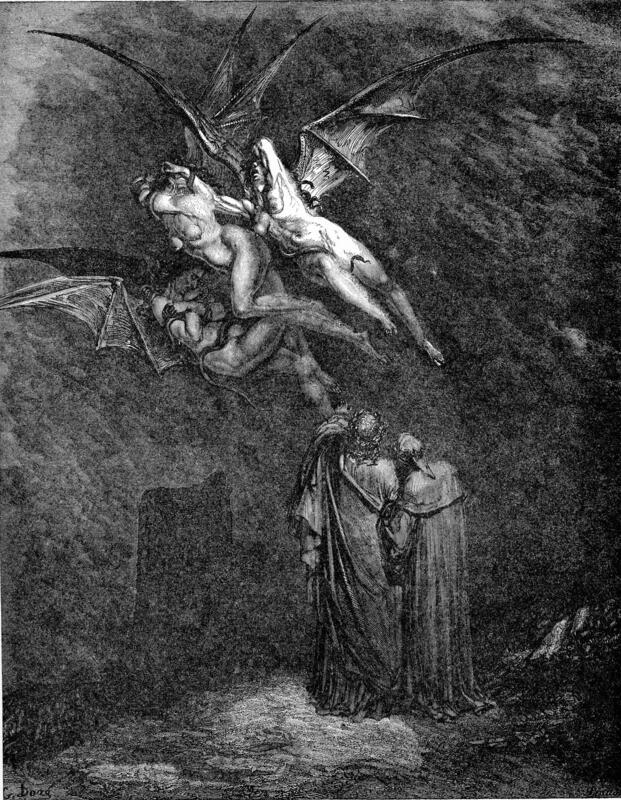 The Furies visit Dante in an engraving by Gustave Doré. Melinoe was a daughter of Persephone (who was the wife of Pluto). She also brings nightmares and madness, although a bit more subtly than the (literally) furious Alecto. I voted for one of the options but think that the pair should be named, Scipio and Hannibal. I voted for Orpheus and Eurydice and now come out on top with… 33.33% (14 votes) !! Wonderful, what a website it is! This website gives valuable facts to us, keep it up.